When Dr. Wes Yemoto crowns one of our patients, the coronation is a celebration of a stronger smile. Wes Yemoto Esthetic Dentistry has been serving patients throughout California with singular efficiency, expertise and personal attention since 1980. If you live in San Jose, Campbell, Los Gatos, or Cupertino, you could be our next royal to smile and wave for the paparazzi. Consult with Dr. Yemoto to find out if you are a candidate for innovative restorative procedures. Keep in mind that crowns come in a variety of strong, reliable materials. Matching the natural color of your teeth increases the beauty of your smile. 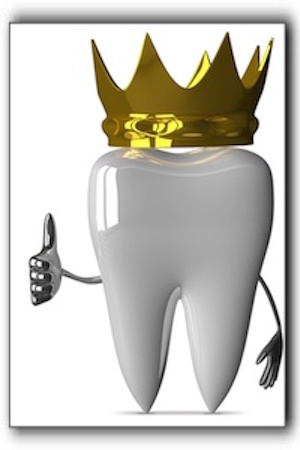 Gold crowns are incredibly strong and have the “bling” factor, but there are plenty of other options. In addition to restorative services, we would love to meet with you about cleanings, cosmetic services, teeth whitening, braces, veneers, and other smile makeover possibilities. We are equipped to offer prepless veneers, sleep apnea/snoring, dental implants, general dentistry and a long list of other procedures. Schedule your visit today with our experienced staff at 408-266-9957.